The Town Council sets aside money within its budget each year for awarding grants to local organisations. For the year 2019/20 £35,000 has been set aside for small grants of between £250 and £2,000. Applications for grants will be assessed twice annually (see Application deadlines). The Council will aim to award half the money available in each window but has the discretion to award more or less than half dependent on the quality of applications received. The Council is also a key contributor to the Stanley Community Fund, which will be administered by the County Durham Community Foundation and will award £120,000 in 2019/20 in grants between £2,000 and £10,000. Details of how to apply for this fund will be released shortly. Will the grant benefit Stanley residents? The Town Council will only give grants for purposes which directly benefit Stanley residents and will give priority to organisations which are based in the Stanley Town Council area. The Council may consider grants to organisations that cover a wider area than Stanley (e.g. the Derwentside area or North Durham) if the organisation provides services to Stanley residents or which benefit the Stanley area. The Town Council will not generally contribute to national appeals or to appeals that benefit only a single individual. Can the applicant organisation show that it needs the grant? The Town Council has only limited funds and therefore will only give grants to organisations that can demonstrate that a grant from the Town Council will make a difference and that there are not alternative ways of raising the money. You will be required to provide a copy of your most recent accounts (including a balance sheet), annual report if you produce one and details of other organisations approached for funding and whether you were successful. The Town Council will not normally provide grants to organisations which, for example, have large unallocated reserves or where funding should be available from another source. In some circumstances the Council may provide advice and information, or request that your organisation re-applies after exploring alternative options. Does the applicant organisation follow basic organisational rules? The Town Council will only give grants to properly constituted bodies that are not for profit. This usually means that, at a minimum, the organisation should have a constitution, set of rules or memorandum and articles. The organisation should have clear roles and responsibilities and produce annual accounts. All grants will be paid by BACS and paid direct to the organisation’s account. Payment will not be made to any individual’s personal bank account. What purposes must the grant be used for? Applicants must identify a specific purpose for which funding is sought. Acceptable examples include capital grants for a specific project or purchase, upgrading existing facilities, training costs, and start-up costs for new initiatives/projects. Grants will not be given towards activities that are part of statutory obligations, or research costs. Retrospective applications where an event or activity has already taken place will not be considered. Organisations with a profit making remit are not eligible nor are religious/political activities unless it can be shown that the event will be open to and for the benefit of the community as a whole. The list above provides examples only, more detailed criteria can be found below. A single application under the Strategic Grant Fund can be be a maximum of £2,000. No application for under £250 will be considered under this process. A single applicant may apply for a grant in each and any round of funding but only one application per applicant will be considered in any single round of funding. The organisation’s constitution or other governing document. All accounts relating to the organisation must be disclosed, not just those relating to the specific purpose associated with the application. If your latest accounts show more than 12 month running costs in reserves please give an explanation as to why you require additional funding. An explanation as to why your organisation needs this funding. How the provision of the grant supports the Town Council’s objectives. The application should be supported by estimates for the project where appropriate, or a price list for items of equipment to be purchased and any further information requested by the Town Council. Only one grant per funding round will usually be made to any applicant. Applicants are not precluded from applying for a grant in any round of funding, even if they have received a grant in an earlier round in the same year (provided the grant application meets eligibility criteria). Organisations are encouraged to search for sustainable alternative means of funding their activities. Acceptance or refusal of a particular application does not determine, predicate or influence the outcome of any further applications by the Town Council at a later date. The Town Council may, at its discretion, fund all or only part of any given application. Applicants agree that if they are awarded funding by the Town Council, they will participate in publicity which will as a minimum include a presentation photograph with the Town Mayor and press release. A spokesperson for the applicant organisation must be prepared to give a quote which the Town Council can use in any publicity material. Funding will not be released to the applicant until the publicity conditions have been met. The Council reserves the right to attach specific conditions to any individual grant above and beyond the conditions in this policy. Any such conditions will be explained in your offer of grant letter. You must state at the time of your application if you are applying to other funding organisations for match or part funding, or if you have already raised part of the funding from other sources. The Council reserves the right to reclaim any award not spent for the purposes it was granted and/or not spent during the financial year it was awarded. All decisions regarding applications are final and non-negotiable. Projects that have ongoing costs that extend beyond the year in which the grant is allocated unless agreement to meet the additional costs has been secured. Projects that do not start within 12 months of the date application. Projects that could lead to future operating cost difficulties for the recipient organisation. Religious projects that are deemed denominational, although faith-based organisations can be supported where there is wider community benefit. Projects that should be paid from mainstream budgets of the principal authority or of an external agency UNLESS it can be demonstrated that the project will provide ‘additionality’. Funding for mainstream educational activity i.e. activities/services that schools have a statutory responsibility to provide. Projects where the applicant has not managed a previous grant satisfactorily. Funding for VAT that the recipient organisation can recover. Funding loans and interest payments. Funding for payments to employees of the organisation arising from claims of unfair dismissal or redundancy. Funding for the purchase of used vehicles. Grants will not be awarded to organisations for the purpose of facilitating further grants to be made by that organisation. All applications must be related to the direct cost of an initiative being undertaken by the applicant. Further grants to an organisation will not be considered where there is outstanding monitoring and/ or feedback from projects previously funded by the Town Council. 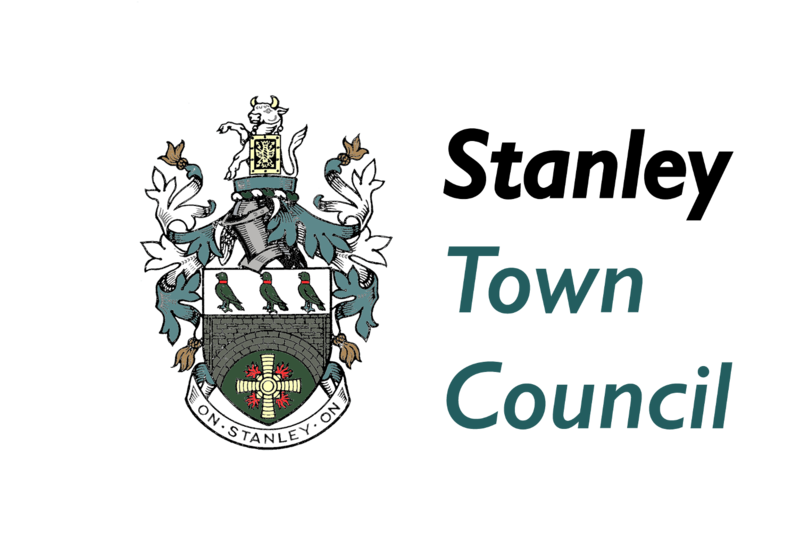 Your organisation must acknowledge the support of Stanley Town Council and include the Town Council logo in any promotional material. This helps let people know where the Council’s grant aid is being spent and to encourage others to apply. You will be asked to forward to us any publicity and photographic evidence of the project/purchase where appropriate and this may be used on the Town Council’s websites and publications. Recipients of Town Council grant funding must NOT portray the Town Council in a negative light to the general public or make politically motivated statements to the public. Update the Town Council on progress. Provide to the feedback to the Council detailing how the grant was used. The Funding Appraisal Panel will consist of 6 members of Stanley Town Council and will reflect as close as is practicable the political balance of the Council overall. The Chair of the panel will be appointed by the Town Council. The panel will meet twice yearly, in June and November and its role will be the appraisal of projects for suitability against the councils grant making policy and the Council’s Medium Term Plan Objectives and make funding recommendations to the Full Council. The panel will also inspect the monitoring and evaluation of all grants made in previous rounds of funding including the impact of these projects on the wider community and highlight projects which were particularly effective (or not) to the Council in its report. Round 2: 1st Sept. to 30th Oct.
Funding decisions will be made at the Full Council meetings in June and November each year and applicants notified of the outcome of their application thereafter.